I’ve been learning about intersectionality, a new concept to me, first from a workshop at Frog Hollow Neighbourhood House and then in a course I am taking on community change and activism. 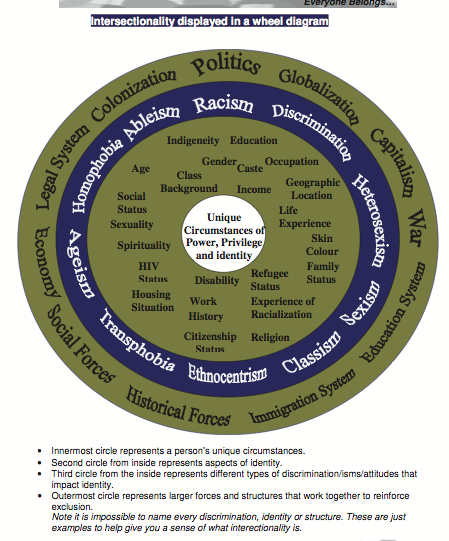 I liked how this diagram demonstrates the intersection of many issues that affect any given individual. The medicalisation and professionalisation of my field (supporting people with intellectual disabilities) has kept our leaders out of many conversations that affect other populations, perhaps to our detriment. “Disability” is not even listed, although “ableism” is – which in itself is a new conversation for many!